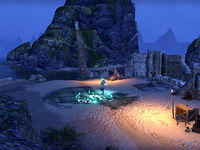 Seaside Scarp Camp is a small camp located in southern Auridon, just west of the ruins of Tanzelwil. The camp is the headquarters of the Bandit Lord Quenyas. When attacked she will summon a large Bone Colossus named Oskana and a number of zombies to assist her in battle. Prior to some patch before Update 13, this location had three tents, a few sleeping bags, and a cooking pot at the center, with little else. After the patch, it was changed to an Elven ruin, having two of the tents and the cooking pot removed. There is a broken shrine near the wall with the emblem of Akatosh on it.